The magnetic field at P due to the current I in the wire W1 is directed normally into the plane of the figure (away from the reader). The magnetic field at P due to the current 3I in the wire W2 opposes the above field. Since the magnitude of the field due to the wire W2 is three times that due to the wire W1, the resultant field will be directed normal to the plane of the figure, towards the reader [Option (d)]. (2) In the above question if the current 3I in the wire W2 is switched off, what will be the magnetic field at P? The direction of the magnetic field produced by the current I in the wire W1 is opposite to the net field B in question No.(1). So the sign has to be negative. 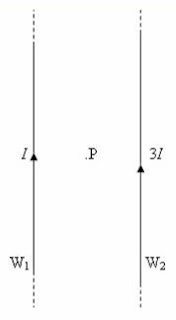 Since the currents I and 3I in the wires W1 and W2 produce opposing fields at P (in question no.1), the resultant field B has magnitude proportional to 2I. When the current 3I in the wire W2 is switched off, the field at P is proportional to I so that the magnitude is reduced to half the net value in question No.(1). The field at P in this case is therefore – B/2. B = μ0nR2I/2(R2 + x2)3/2 where n is the number of turns in the coil. Since the current in the coil is reversed, the direction of the magnetic field must be reversed so that the correct option is – B0/√8. Outside the magnetic field the path of the electron is straight and is contained in the xy plane. The magnetic field is directed along the negative z-direction an hence the electron enters normally into the magnetic field. A magnetic force acts perpendicular to the direction of motion of the electron. The path of the electron within the magnetic field will therefore be circular. But the speed will be unchanged since a stationary magnetic field cannot change the kinetic energy of the electron. The correct option is (e). [If the initial velocity of the electron had an z-component also (for instance, v = 30 i + 40 j + 20 k), the electron would enter the magnetic field at an angle other than 90º and then the path would be helical].